Can You Persuade on Paper As Well As You Can Speak? Can you persuade on paper as well as you can speak? Few can. In hundreds of daily conversations, people convince listeners to accept or consider their ideas. But their writing rarely equals that success. 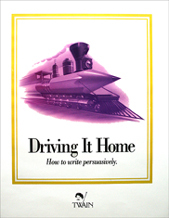 This program will show you how to “drive” the persuasive element in your writing. Why Are We So Weak, So Ineffective When We Write? Malcolm Forbes, the late Chairman of Forbes magazine, once said, “Over 10,000 business letters come across my desk every year. They seem to fall into three categories: stultifying, if not stupid; mundane (most of them) and first-rate (rare).“ Why? Too often people think persuasion is necessary only in certain contexts, like advertising, politics, or sermons. On the contrary–it is a necessary ingredient of anything you write. If you want to form an opinion in your reader’s mind, that takes persuasion. Perhaps–a tougher chore–you need to change his or her mind. Sometimes you wish to have the reader modify an opinion–meet you halfway. And a secondary purpose of most messages is to reinforce some opinion you assume the reader already has; the boss, that you are a good employee; the customer, that you are expert in your field, and so on. Sometimes all you want is for the reader to re-evaluate your opinion, with an open mind. None of these — forming an opinion or changing one; modifying one or reinforcing one; or getting yours considered — none of these just happens. Each requires persuasion. The truth is: When the persuasive element fails, writing fails. In just a half hour, you can learn the secrets of how to write persuasively in the DVD and workbook Driving It Home. These secrets are yours for only $55 (plus $8 shipping.) There’s no risk because you have Twain’s Money Back Guarantee. Corporations, institutions and consultants often wish to purchase books and videos for training employees to write clearly.